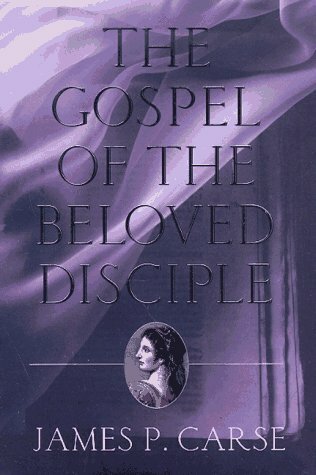 Written from the perspective of a woman disciple, a thought-provoking, evocative Gospel offers a vivid portrait of a very human Jesus Christ, one with a sense of humor, who rejects conventional pieties and relates stories imbued with the profound mystery and relevancy of his teachings. $50,000 ad/promo. Tour. Amazon.com description: Product Description: In this literary and religious tour de force, Carse daringly revives the ancient tradition of writing gospels to communicate the contemporary meaning of Jesus' life and teaching. This tradition resulted in dozens of gospels, such as the Gospel of Thomas, but died out when the Church closed the New Testament with its four official or "canonical" Gospels Matthew, Mark, Luke and John. This, then, is the first full, all-new gospel in 1,500 years. It is not yet another novel about Jesus, such as those by Nikos Kazantzakis and Norman Mailer, nor is it is a harmonizing of the traditional gospels, like those by Leo Tolstoy and Reynolds Price. As James Carse says, in introducing readers to this gospel, "What is needed, now as before, is imagination, but imagination that takes no more liberty with the known historical material than the earlier gospels themselves took.... Each [evangelist] wrote a gospel grounded in the time of Jesus and his own time. Why should we do less?" The book's prologue dramatically sets the stage by telling how, long after Jesus' death, some of his followers bring an old woman a parchment scroll on which they have painstakingly assembled Jesus' story, piercing together what they remember of him. They come to her because, as "the one Jesus loved," she knew him best. She listens carefully to their "gospel" and, when they are through, tersely responds that "it wasn't like that....There is too much to say to end it here." And thus begins her gospel, the first full gospel from a woman's point of view. She recounts many of the events of Jesus' life that we know from the New Testament gospels such as his birth, baptism, transfiguration, trial and crucifixation but in a very different and fully credible way. What her gospel brings is her perspective as his most intimate companion; she knew Jesus better than anyone else and wants to tell his story as she really experienced it, not to mythologize him or advance some Church agenda. Perhaps most arresting is her gospel's vivid presentation of Jesus' trenchant exchanges with the people he encounters and its many delightful and though-provoking parables.